To quote a friend - "Like you haven't slept for a few years"
Here are some common problems we face! However I don't want to choke my skin by using tons of products on my face (plus I don't know how to do all the complicated concealing, shading & whatnot) & it's so time-consuming when I'd rather be sleeping. I would like a product that lets my skin breathe yet solves my problems! The Garnier Miracle Skin Perfector is great for those rushed mornings! It's a 10-in-1 tinted moisturizer with a BB finish, suitable for all skin types. It uses lemon essence, a natural exfoliator, to boost your skin's radiance & even out your skin tone to reveal a natural glow! 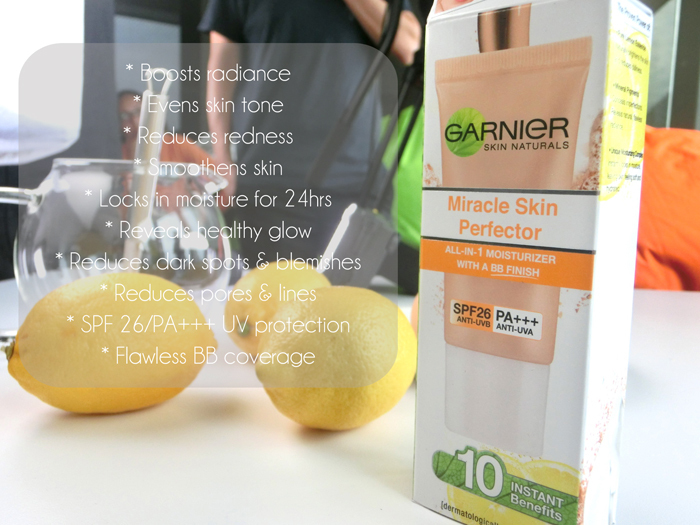 The Garnier Miracle Skin Perfector can be applied like any other moisturizer - simply blend it in evenly & that's it! Last week, I tested the time taken to apply the Garnier Miracle Skin Perfector & Garnier BB Eye Roll-On against toasting bread - which took 2 minutes. Garnier Miracle Skin Perfector vs Instant Oatmeal! Thank you to everyone who sent in their breakfast challenge suggestions! I look much fresher with my dark eye circles & redness concealed! This is easily an acceptable look for work or school. If you wish to look at little more dressed up, you can add on eyeliner! With an even & radiant skin tone thanks to the Garnier Miracle Skin Perfector, all you need to do is add on a little bit more makeup to achieve your desired look! Healthy-looking skin is the most important when it comes to putting your best face forward (hehehe). My eyebags can't magically disappear, but the cooling properties of the Garnier BB Eye Roll-on also help to reduce puffiness while concealing your dark eye circles :) Perfect for those tired-looking eyes! And there's an easy, quick & simple morning makeup-routine to be presentable for the day! If you wish to purchase the Garnier Miracle Skin Perfector, it is retailing at $15.90 at all leading pharmacies & supermarkets. Find the Garnier Facebook page HERE. 6 comments on "Garnier Miracle Skin Perfector"
To remove it at the end of the day, do I need to use a make up remover? Or a regular cleanser will do? A regular cleanser should be fine but if you want to be thorough just quickly wipe it off! Especially if you have large pores I think? I have gone through the blog. This is an amazing Blog. I have dry skin and dark spot on my face. Now I use Obagi nu-derm clear regularly. This is a quality obagi products. But I want to use Garnier Miracle Skin Perfector . Should it suitable for my skin?